The Home Depot contracted Macquarium for their expertise in branding, marketing, and user-experience design for E-Commerce solutions. 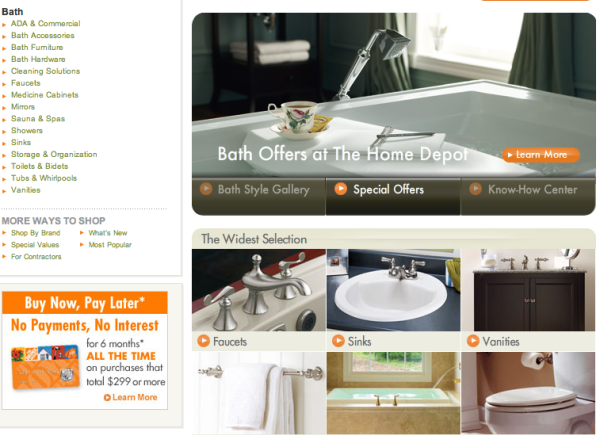 Losing on-line and in-store sales to other competitors, THD wanted to use their website as a tool to drive sales into the store. Their major challenge was customres viewing THD as a place to go for fix-it solutions, while they shopped at their competitors’ for a remodelling/big-budget solution. With the help of interviews (stakeholders, vendors, store managers, and customers), our team helped come up with a strategy for THD to market themself as a holistic brand rather than a fix-it stop. From this strategy, information design emerged to meet the requirements of all user groups.